Still looking for that perfect personalized gift? Here’s a great one that will only cost you $3.99 in shipping. 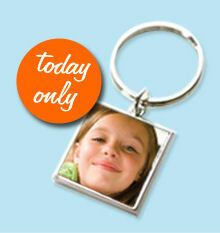 Today only (12/6), the Snapfish Deal of the Day is a FREE photo keychain worth $18.99! You’ll also get 50 FREE prints. Note: If you think this is something you might want to take advantage of, sign up today. You’ll have five days to create your FREE photo keychain, although I wouldn’t wait long so you can receive it in time for Christmas.